It’s now confirmed that the public event on 6 June (click here for the poster) will feature images from the Clubland project by HungryVisuals. One of the most interesting avenues that we’ve been exploring on the ethnographic side of the project is the embodied nature of valuing. Good DJs learn to read a crowd’s physical responses to music, for example. And different venues are characterised by different ways of physically expressing appreciation for the music played. The Clubland project is a unique attempt to document the London club scene through medium format photography, and as such it provides a powerful record of the embodiment of electronic music and its value. We have been exploring how visualisations can illustrate over time how users comment on tracks in SoundCloud. Commenting has been highlighted in our qualitative research as a way of building relationships and showing appreciation of other musicians’ work. In fact, initial inspection of a sample set of comments is showing that most comments in our samples tend to be positive or constructive, rather than overly critical or negative. Valuing Electronic Music: poster available! Valuing Electronic Music is an ongoing study of electronic music and the people who value it, carried out by Daniel Allington (Open University), Anna Jordanous (King’s College, London), and Byron Dueck (Open University). Our work explores how the value of electronic music transcends economic value for producers, DJs, and audiences – and how geographical location continues to play a significant role in the recognition of musical value even where musical scenes become increasingly international (thanks in large part to websites such as SoundCloud). Such findings have implications for the careers of music-makers more generally. 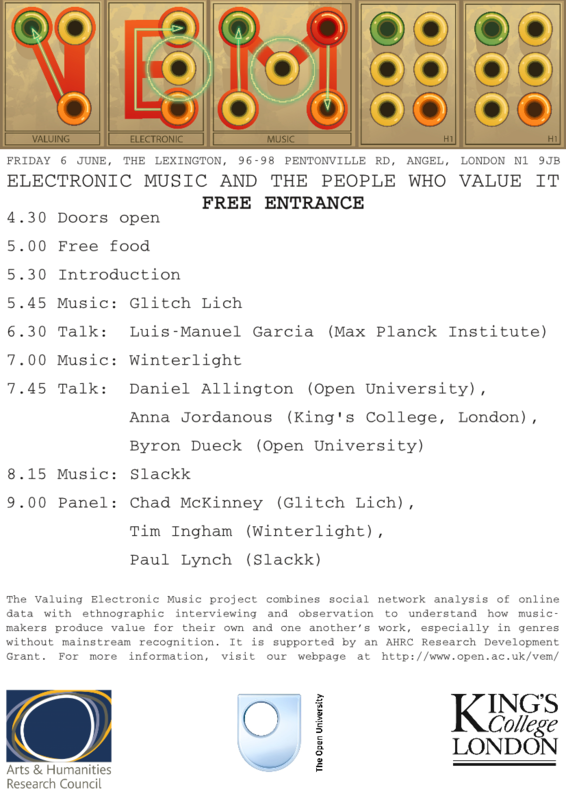 We now have a programme for the Valuing Electronic Music event of 6 June 2014. There’s also now a page for the event on Facebook – shares would be much appreciated! The Valuing Electronic Music workshop took place yesterday at the Open University’s London offices in Camden, with contributions from Kate Oakley, Nick Crossley, Maddy Radcliff, Simon Tanner, Charlotte Tupman, Alistair Willis, and Matthew Yee King as well as Anna, Byron, and myself. It was a great opportunity to share what we’ve found so far with an expert audience and get informed feedback on the project as a whole. It’s a scary thought, but we’re halfway through the funded stage of this project. The timescale is tightly compressed and it’s been a bit manic at times (especially right now, with a workshop next week and a public event in less than a month). But we’ve already learnt so much. So I’d like to reflect briefly on an observation Byron made last month, reflecting on the interviews he’d been carrying out with electronic music producers: ‘when I ask questions about valuing and appreciation, people answer about relationships.’ Outside the spheres of commercial music (where value is expressed in economic terms) and art music (where it is expressed in terms of grants, academic appointments, etc), human relationships are the beginning and the end of musical value. So perhaps it’s true that when musicians build relationships through music, they are producing not the opportunity to produce value (the aim of ‘business networking‘), but value itself. Film: Is how we acknowledge music’s value changing?